In a medium saute pan, cook the bacon to a crisp and then transfer to a paper towel-lined plate and set aside. Cook pasta in salted water according to package directions, until al dente. Add the peas to the pasta water in the last minute of cooking. Reserve 1 cup pasta water before draining the pasta and peas. 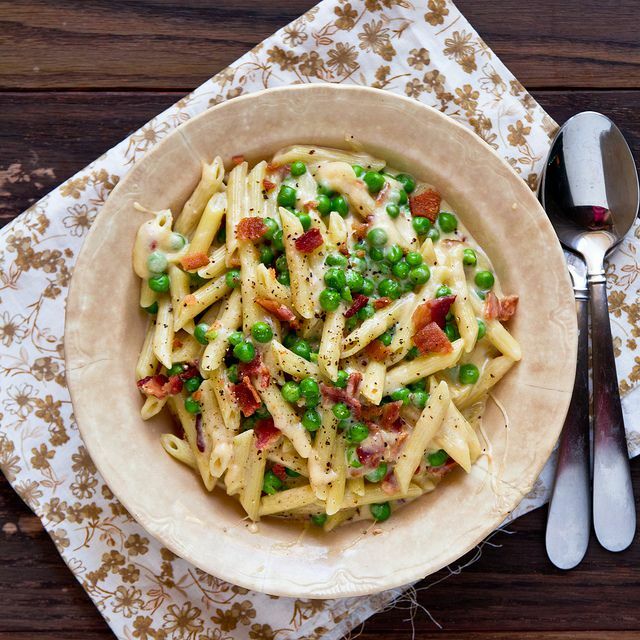 Return the pasta and peas to pot. Add 1/4 cup pasta water (it must be hot), the yogurt, a few dashes of hot sauce, and 1/3 of the grated cheese and stir until the cheese has melted. Stir in remaining cheese, one small handful at a time to prevent clumping. Add additional pasta water as necessary to thin and melt the cheese sauce. Add the bacon, mix well, and serve.